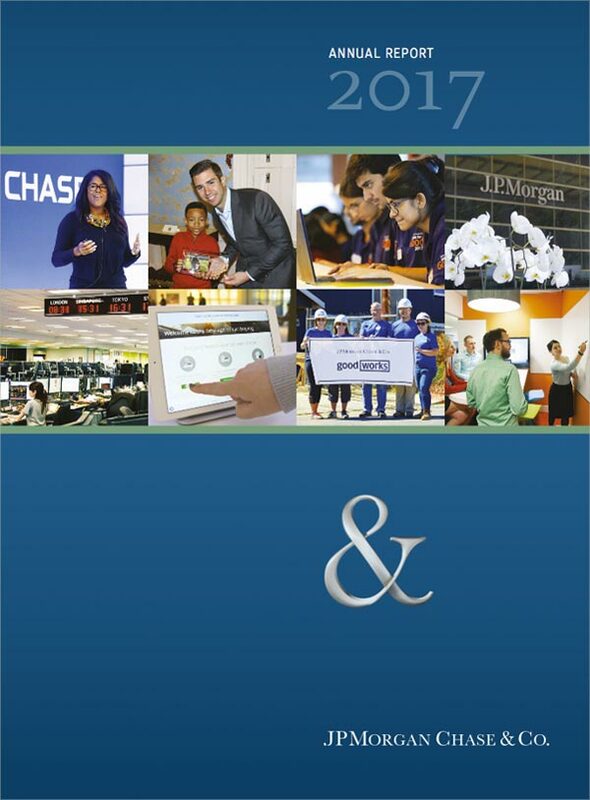 ﻿ Jamie Dimon's Letter to Shareholders, Annual Report 2017 | JPMorgan Chase & Co.
Once again, I begin this letter with a sense of pride about JPMorgan Chase. As I look back on last year — in fact, the last decade — it is remarkable how well our company has performed. And I’m not only talking about our strong financial performance — but also about how much we have accomplished to help our clients, customers and communities all around the world. Ours is an exceptional company with an extraordinary heritage and a promising future. We continue to make excellent progress around technology, risk and controls, innovation, diversity and reduced bureaucracy. We’ve helped communities large and small — by doing what we do best (lending, investing and serving our clients); by creatively expanding certain flagship Corporate Responsibility programs, including the Entrepreneurs of Color Fund, The Fellowship Initiative and our Service Corps; and by applying our successful Detroit investment model to neighborhood revitalization efforts in the Bronx in New York City, Chicago and Washington, D.C. Throughout a period of profound political and economic change around the world, our company has been steadfast in our dedication to the clients, communities and countries we serve while earning a fair return for our shareholders. 2017 was another record year across many measures for our company as we added clients and customers and delivered record earnings per share. We earned $24.4 billion in net income on revenuefootnote1 of $103.6 billion (if we exclude the tax charge at year-end, 2017 net income would have been a record $26.9 billion), reflecting strong underlying performance across our businesses. We now have delivered record results in seven of the last eight years, and we have confidence that we will continue to deliver in the future. As you know, we believe tangible book value per share is a good measure of the value we have created for our shareholders. 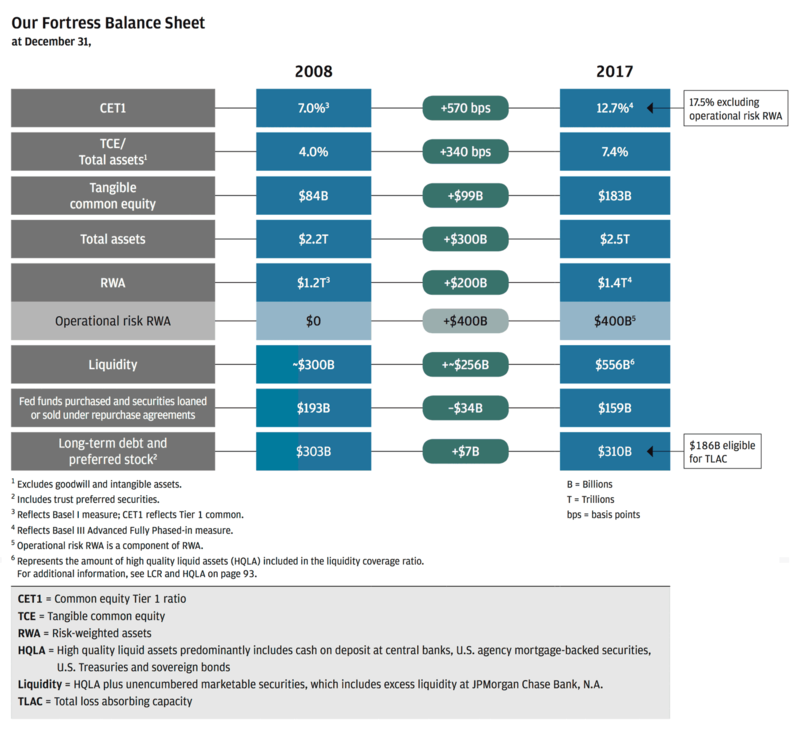 If our asset and liability values are appropriate — and we believe they are — and if we can continue to deploy this capital profitably, we now think that it can earn approximately 17% return on tangible equity for the foreseeable future. Then, in our view, our company should ultimately be worth considerably more than tangible book value. The chart above shows that tangible book value “anchors” the stock price. 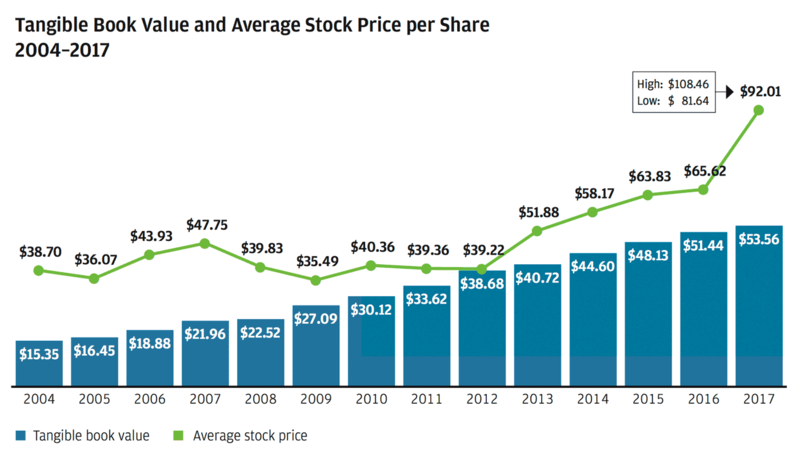 In the last five years, we have bought back nearly $40 billion in stock. In prior years, I explained why buying back our stock at tangible book value per share was a no-brainer. Six years ago, we offered an example of this, with earnings per share and tangible book value per share being substantially higher than they otherwise would have been just four years later. While we prefer buying back our stock at tangible book value, we think it makes sense to do so even at or above two times tangible book value for reasons similar to those we’ve expressed in the past. If we buy back a big block of stock this year, we would expect (using analyst earnings estimates for the next five years) earnings per share in five years to be 2%-3% higher and tangible book value to be virtually unchanged. We want to remind our shareholders that we much prefer to use our capital to grow than to buy back stock. Buying back stock should only be considered when we either cannot invest (sometimes that’s a function of regulatory policies) or when we are generating excess, unusable capital. We currently have excess capital, but due to recent tax reform and a more constructive regulatory environment, we hope, in the future, to use more of our excess capital to grow our businesses, expand into new markets and support our employees. Our stock price is a measure of the progress we have made over the years. This progress is a function of continually making important investments, in good times and not-so-good times, to build our capabilities — people, systems and products. These investments drive the future prospects of our company and position it to grow and prosper for decades. 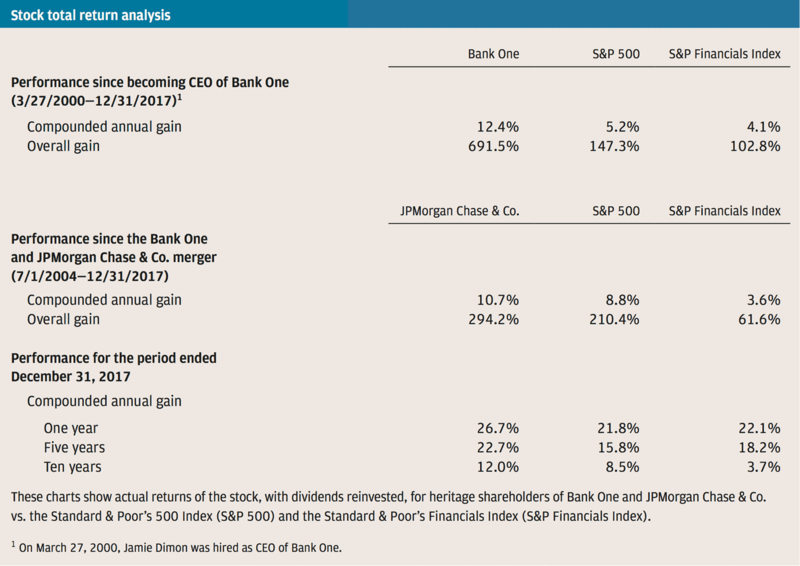 Whether looking back over five years, 10 years or since the Bank One/JPMorgan Chase merger (approximately 13 years ago), our stock has significantly outperformed the Standard & Poor’s 500 Index (S&P 500) and the S&P Financials Index. 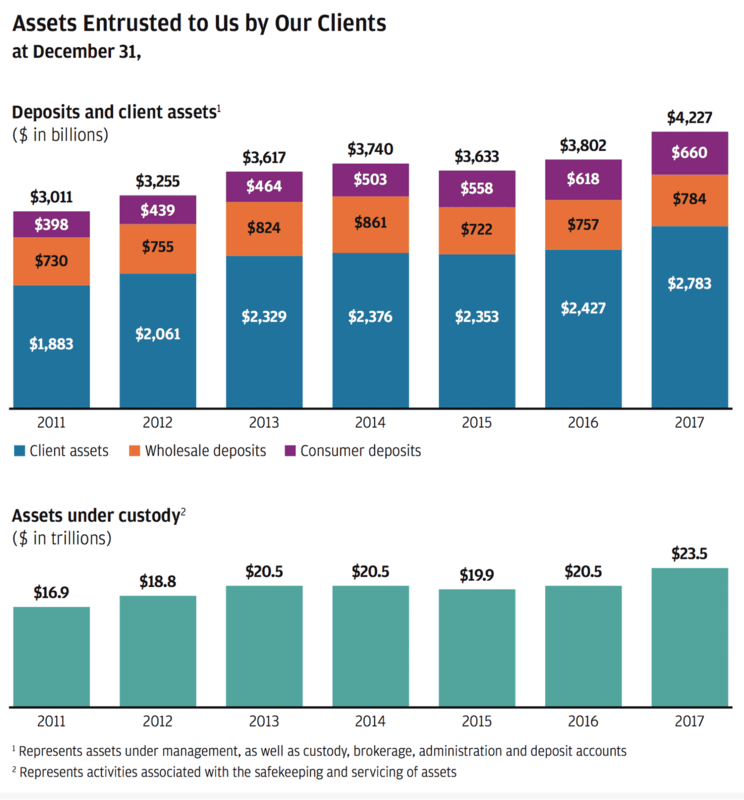 And this growth came during a time of unprecedented challenges for banks — both the Great Recession and the extraordinarily difficult legal, regulatory and political environment that followed. We have long contended that these factors explained why bank stock price/earnings ratios were appropriately depressed. 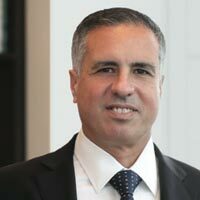 And we believe the anticipated reversal of many negatives and an increasingly more favorable business environment, coupled with our sustained, strong business results, are among the reasons our stock price has done so well this past year. We do not worry about the stock price in the short run, and we do not worry about quarterly earnings. Our mindset is that we consistently build the company — if you do the right things, the stock price will take care of itself. In the next section, I discuss in more detail how we think about building shareholder value for the long run while also taking care of customers, employees and communities. 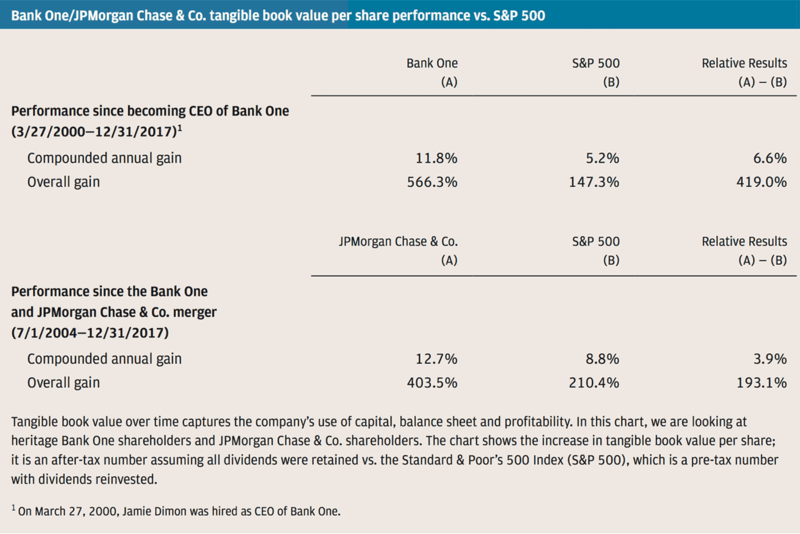 JPMorgan Chase stock is owned by large institutions, pension plans, mutual funds and directly by individual investors. However, it is important to remember that in almost all cases, the ultimate owner is an individual. Well over 100 million people in the United States own stocks, and a large percentage of them, in one way or another, own JPMorgan Chase stock. Many of these people are veterans, teachers, police officers, firefighters, retirees, or those saving for a home, school or retirement. Your management team goes to work every day recognizing the enormous responsibility that we have to perform for our shareholders. In this letter, I discuss the issues highlighted below — which describe many of our successes and opportunities, as well as our challenges and responses. How will the company continue to grow? What are the organic growth opportunities? Why is organic growth a better way to grow — and why is it sometimes difficult? Transparency, financial discipline and a fortress balance sheet. Why is this discipline so important? What risks worry us the most? And what could go wrong? How is the company dealing with bureaucracy and complacency that often infect large companies? What are the firm’s views on succession? What has gone wrong in public policy? Poor public policy — how has this happened? We can fix this problem through intelligent, thoughtful, analytical and comprehensive policy. The need for solutions through collaborative, competent government. A competitive business tax system is a key pillar of a growth strategy. We should reform and expand the Earned Income Tax Credit and invest in the workforce of the future. America’s growing fiscal deficit and fixing our entitlement programs. Why is smart regulation vs. just more regulation so important? Public company corporate governance — how would you change it? And the case against earnings guidance. Global engagement, trade and immigration — America’s role in the world is critical. Since our business leaders describe their businesses later in this report, I am not going to be repetitive within this section. I encourage you to read their letters following this Letter to Shareholders. Instead, in this section, I deal with some critical themes around how we run this company — in good times and in bad times — and how we are continuing to build for what we think will be a bright future. 1. How has the company grown? Below is a powerful representation of how we have grown and built client franchises over time. You can see from the numbers circled within the chart below that we have grown our market share fairly substantially in most of our businesses. In some cases, these market share increases were due to our acquisitions of Bear Stearns and Washington Mutual. But in all cases, this growth is driven by consistent and disciplined investment in our businesses. 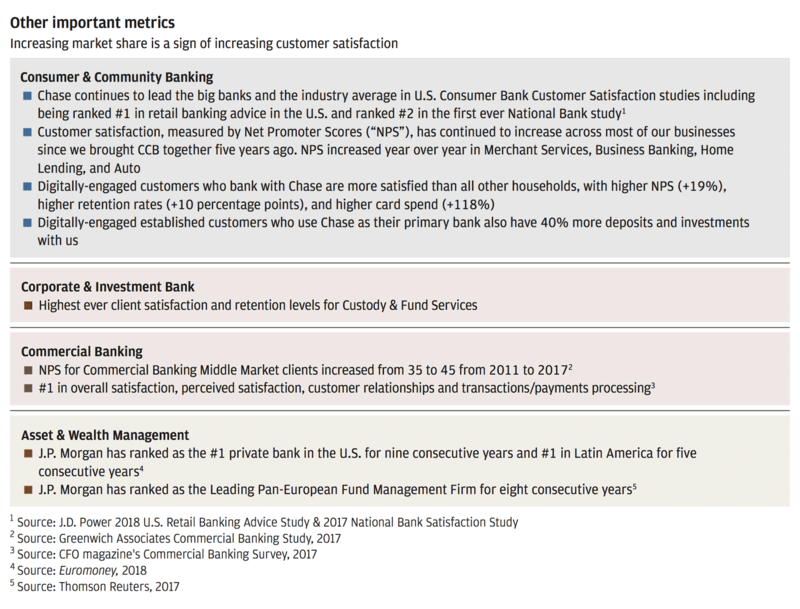 The second chart below shows how we try to measure customer satisfaction in multiple ways. For the most part, we have seen a rise in these scores as well. It is a given that you will not grow your share — unless you are satisfying your customers — and we know they can always walk across the street to be served by another bank. 2. How will the company continue to grow? What are the organic growth opportunities? We recently announced that we will start to expand the consumer branch business into cities like Boston, Philadelphia and Washington, D.C. Over the next five years, we hope to expand to another 15-20 new markets. We know the competition is tough, but we have much to offer. When JPMorgan Chase comes to town, we come not just with our consumer branches but also with mortgages, investments, credit cards, private banking, small and midsized business banking, government business and corporate responsibility initiatives to support our communities. In addition, this year we are rolling out many new exciting products and have made several improvements around the customer’s experience, including a fully mobile bank pilot (Finn), digital account openings, facial recognition in our app, the Amazon Prime Rewards Visa card and a simpler online application for Business Banking customers. We also are adding many tools that will help our customers manage their financial affairs. For example, in the credit card business, we will be allowing our customers to review and decide how and where they want their cards and credit lines to be used. In Consumer Banking, we are adding financial planning tools and insights that help customers make the most of their money – and there’s more coming. We see growth opportunities even in Fixed Income, Currencies and Commodities, where we already have the #1 market share at 11.4%. There may be some underlying growth as the capital markets of the world grow, even though this is partially offset by declining margins like we have experienced over the last 30 years. However, we see opportunities to gain share in various products and in certain regions where we have low share. This opportunity would be true for Investment Banking, too. Country by country and industry by industry, there are still plenty of opportunities to increase our low market share. For example, we have 10% share in the United States but less than 5% share in Asia. In Treasury Services and Custody, where our market shares are 4.7% and 8.0%, respectively, we believe we can grow significantly by adding bankers, building better technology, entering new countries, building better products and continuing to do a great job for clients. In this business, while you make large initial investments in order to grow, when you gain clients, they usually stick with you for a long time. 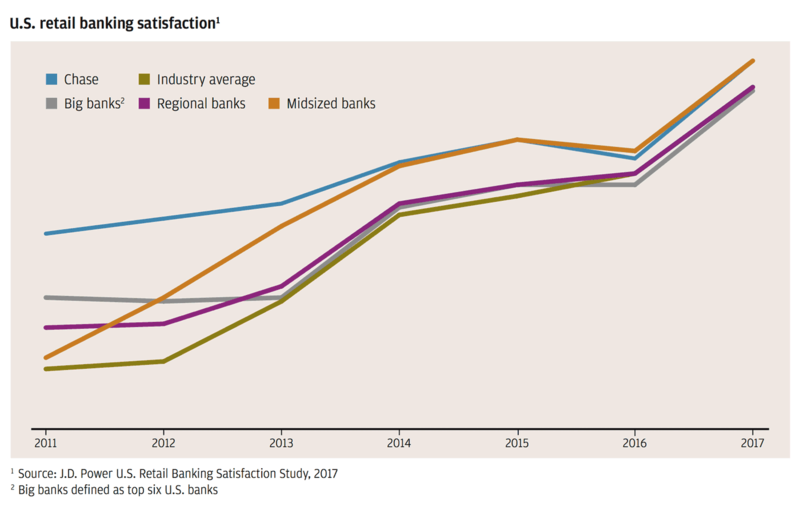 This past year, Commercial Banking has completed its expansion into the top 50 markets in the United States — this will drive growth for decades. And remember, when Commercial Banking opens its doors, it also helps drive the growth of our Private Bank and the Corporate & Investment Bank businesses. Commercial Banking has added many specialized industry bankers to better serve those specific segments. In the United States, our share of the ultra-high-net-worth market ($10 million or greater) is 8%. We believe we have a superior business and that we can grow our share by essentially adding bankers, branches and better products. In the high-net-worth business ($3 million to $10 million) and the Chase affluent business ($500,000 to $5 million), our market shares are only 1% and 4%, respectively. We have no doubt that we can grow by adding bankers and locations, particularly because we have some exciting new products coming soon. There is no reason we can’t more than double our share over the next 10 years. We are also adding new products, like index funds and exchange-traded funds (ETF), that we believe will help drive growth. In addition, we are undertaking many initiatives across the company that will help grow our businesses and better serve our customers. On the payments front, we have developed multiple products to make wholesale payments better, easier and faster. We are rolling out these products across our platforms, and they should help us solidify and grow our position. On the consumer side, we have introduced Chase Pay, the digital equivalent to using a debit or credit card, which allows customers to pay online or in-store with their mobile phone. We also introduced Zelle, a real-time consumer-to-consumer payments system, which allows customers to easily, safely and immediately send money to their friends and family. We expect these products to drive lots of customer interactions and make our payments offerings compelling, even as some very smart fintech competitors emerge. Across the company — not just in technology — we have thousands of employees who are data scientists or have advanced degrees in science, technology, engineering and math. Of the nearly 50,000 people in technology at the company, more than 31,000 are in development and engineering jobs, and more than 2,500 are in digital technology. Think of these talented individuals as driving change across the company. Artificial intelligence, big data and machine learning are helping us reduce risk and fraud, upgrade service, improve underwriting and enhance marketing across the firm. And this is just the beginning. Our shared technology infrastructure — our networks, data centers, and the public and private cloud — decreases costs, enhances efficiency and makes all our businesses more productive. In addition, this allows us to embrace the fact that every business and merchant has its own software and also wants easy, integrated access to our products and services. We are delivering on that through the creation of a common JPMorgan Chase API (application programming interface) store that allows customers to add simple, secure payments to their software. And we are building everything digital — both for individual customers and large corporations — from onboarding to idea generation. Increasingly, the management teams of Consumer & Community Banking, Corporate & Investment Bank, Commercial Banking and Asset & Wealth Management share ideas, share platforms and serve each other’s customers. The success of any one business almost always helps the other three. Privacy and safety — we spend an enormous amount of resources to protect all of our clients and customers from fraud, cybersecurity risk and invasion of their privacy. These capabilities are extraordinary, and we will continue to relentlessly build them. As part of this, we have consistently warned our customers about privacy issues, which will become increasingly critical for all industries as consumers realize the severity of the problem. Last year, we wrote about a new arrangement with Intuit that bears repeating — it briefly described the problem and presented a solution, which we hope might set a standard for protecting customers while giving them control of their data. For years, we have been describing the risks — to banks and customers — that arise when customers freely give away their bank passcodes to third-party services, allowing virtually unlimited access to their data. Customers often do not know the liability this may create for them if their passcode is misused, and, in many cases, they do not realize how their data are being used. For example, access to the data may continue for years after customers have stopped using the third-party services. We recently completed a new arrangement with Intuit, which we think represents an important step forward. In addition to protecting the bank, the customers and even the third party (in this case, Intuit), it allows customers to share data – how and when they want. Under this arrangement, customers can choose whatever they would like to share and opt to turn these selections on or off as they see fit. The data will be “pushed” to Intuit, eliminating the need for sharing bank passcodes, which protects the bank and our customers and reduces potential liabilities on Intuit’s part as well. We are hoping this sets a new standard for data-sharing relationships. Events from the past year underscore the importance of efforts like this. As questions are raised about how consumers’ information is shared and protected, I strongly believe that data privacy and security should be a way in which we and other businesses compete to serve customers. 3. Why is organic growth a better way to grow — and why is it sometimes difficult? Organic growth is all about hiring and training bankers, opening branches, improving or innovating new products and building new technology. It is hard work. In fact, institutionally, there is often a lot of resistance to it. It’s easier not to add expenses, even when they are good for the business. And growing any sales force is usually met by some opposition from — guess who? — the existing sales force. Sometimes people are afraid the change will take away from their compensation pool or their client base. And it’s hard work to properly recruit and train salespeople. Building new products and services is sometimes in conflict with existing products and services. All of these efforts require huge team coordination. So it’s no surprise that it’s sometimes easier not to push organic growth. However, if you build the right culture, where management teams are intensely analytical and critical of their own business’ strengths, weaknesses and opportunities, you can create great clarity about what those opportunities are. If you have strong leaders, they have the discipline and fortitude to develop and execute a forward-looking growth plan. 4. Is there a conflict between building shareholder value vs. serving customers, taking care of employees and lifting up communities? Keeping JPMorgan Chase a healthy and vibrant company is the best thing we can do for our shareholders, our customers, our employees and our communities. Building shareholder value is the primary goal of a business, but it is simply not possible to do well if a company is not properly treating and serving its customers, training and motivating its employees, and being a good citizen in the community. If they are all done well, it enhances shareholder value. Let me explain. We cannot be a healthy and vibrant company if we are not both delivering financial success and investing for the future. Show me a company that is not financially successful (in the long run), and I will show you an unsuccessful company. This is particularly true for a bank, where confidence in its stability is critical. I should caution, however, that financial success is a little more complex than short-term profits – and many investors are completely aware of this. Do not confuse financial success with profits in a quarter or even in a year. All businesses have a different customer and investment life cycle, which can be anywhere from one year to 30 years – think of building new restaurants to developing new airplanes or building electrical grids. Generally, anything our business does to grow will cost money in the short term (whether it’s opening branches or conducting research and development (R&D) or launching products), but it does not mean that it is not the right financial decision. A company could be losing money on its way to bankruptcy or on its way to a very high return on invested capital. Diligent management teams understand the difference between the two scenarios and invest in a way that will make the company financially successful over time. You need to invest continually for better products and services so you can serve your customers in the future. A bank cannot simply stop serving its clients or halt investing because of quarterly or annual earnings pressures. It does not work when long-term investing is changed because of short-term pressures — you cannot stop-start training programs and the development of new products, among other investments. You need to serve your clients and make investments while explaining to shareholders why certain decisions are appropriate at that time. Earnings results for any one quarter or even the next few years are fundamentally the result of decisions that were made years and even decades earlier. We have to be there for our clients in good times and bad. And we have to continuously improve the products and services we provide to them. If you are a bank, your clients rely on you to always be there, regardless of the environment — banks are the lender of last resort. Contrary to public opinion, most banks consistently extended credit to their clients (without dramatically raising lending rates) throughout the Great Recession. The charts above show how we have consistently been there for our clients and that they trust us to hold their assets. Talented, diverse employees deliver lifelong – and satisfied — customers. They also deliver innovative products, excellent training and outstanding ideas. Basically, everything we do emanates from our employees. And all of this creates shareholder value. We do not try to get the last dollar of profit off of our employees’ or customers’ backs. We want long-tenured employees and satisfied customers who stay with us year after year. We would rather earn a fair return and grow our businesses long term than try to maximize our profit over any one time period. Great employees are the result of a healthy, open and respectful environment and continual investment in training. And great employees are the result of management teams that are humble enough to recognize that they don’t know everything their employees do and, therefore, are always seeking out constructive feedback. It is important to explain both what we do and why it is so important for our communities. As the primary engine of economic growth, the private sector has an important role to play in making sure the benefits are widely shared. The future of business and the health of our communities are inextricably linked. We believe that making the economy work for more people is not simply a moral obligation – it’s a business imperative. Using our unique capabilities, we can do even more for our communities to help lift them up. We have broad and unique knowledge around how communities can develop, how work skills can be successfully implemented, how businesses can be started, how inequality can be addressed, how financial health can be secured, and how more families can find jobs and affordable housing. We continue to step up our efforts to help communities. In 2017, we were honored to be ranked by Fortune magazine as the #1 company changing the world in recognition of our work in Detroit and other communities. We are helping communities realize their potential as engines of growth and shared prosperity. In 2014, we launched our most comprehensive corporate responsibility initiative to date to try to help Detroit, an iconic city that was long engulfed in economic turmoil and then bankruptcy. We view our initiative in Detroit as validation of our firm’s model for driving inclusive growth. Three years in, we exceeded our initial $100 million commitment, and we now expect to invest $150 million in the city by 2019. We see the results on the ground – people are moving back into the city, small businesses are being created and expanded, and for the first time in 17 years, property values are on the rise. Our work in Detroit has taught us many important lessons, and this past year, we extended our model for impact to communities in need in Chicago and Washington, D.C. Helping people develop the skills they need to compete for today’s jobs can transform lives and strengthen economies. JPMorgan Chase is investing more than $350 million to support demand-driven skills training around the world. Through New Skills for Youth, we launched additional innovation sites to expand high-quality, career-focused education programs in cities across the United States and around the world. The path to opportunity begins at an early age, but too many young people, particularly from disadvantaged backgrounds, do not get a fair shot at economic opportunity. High school graduation rates for young men of color are dangerously low, and many who do graduate lack the skills they need to be successful in college or their careers. Through programs like The Fellowship Initiative (TFI), we are working to address barriers to opportunity. TFI engages young men of color in a comprehensive program that includes academic support, leadership development and mentoring during their critical high school years. This past year, we expanded this program to Dallas and recruited new classes of Fellows in Chicago, Los Angeles and New York. One hundred percent of these students are graduating from high school, and, combined, they have been accepted into more than 200 colleges and universities across the country. Supporting re-entry programs is an important part of our effort to create opportunity that strengthens communities and results in a stronger economy. The overwhelming majority of Americans who are incarcerated return to their communities after they are released. Reducing recidivism is not only important to returning citizens and their families – it can also have profound implications for public safety. New research from The Brookings Institution shows that, not surprisingly, joblessness and incarceration are related. Barriers to hiring returning citizens come in different forms, and some are imposed from the outside. This year, we welcomed the Federal Deposit Insurance Corporation’s proposed changes to allow banks more flexibility in hiring returning citizens. Our responsibility to recruit, hire, retain and train talented workers extends to this population. Earlier this year, I visited one of our partnering organizations, the North Lawndale Employment Network in Chicago, which gives formerly incarcerated Americans a path to well-paying jobs. The network also builds a pipeline of trained mechanics for Chicago’s growing transportation sector. This is a win-win for workers, employers and the economy as a whole. We are expanding innovative models that enable more people to share in the rewards of a growing economy. Small businesses are growing fastest among people of color, yet, despite their critical role in boosting economic growth, these businesses receive only a fraction of traditional loans compared with non-minority entrepreneurs. In Detroit, a city with the fourth-largest number of minority-owned small businesses, we quickly saw the need to address the challenges facing minority entrepreneurs. Therefore, in 2015, we helped launch the Entrepreneurs of Color Fund in Detroit to provide underserved entrepreneurs with greater access to the capital and assistance they needed. Seeing the tremendous success this program has had in Detroit, we decided to scale this model to the South Bronx in New York City, as well as San Francisco – cities that are experiencing similar challenges. I believe the door to diversity opens when you run a great company where everyone feels they are treated fairly and with respect — this is what we strive to create at JPMorgan Chase. We are devoted to diversity for three reasons, and each reason stands on its own — combined, they are powerful. First, it is the right thing to do from a moral perspective. Second, it is better for business to include a group of people who represent the various communities where we operate. And third, if I can pick my team from among all diverse people, I will have the best team. We have more than 252,000 employees globally, with over 170,000 in the United States. Women represent 50% of our employees. Recently, Oliver Wyman, a leading global management consulting firm, issued a report stating that it would be 30 years before women reach 30% executive committee representation within global financial services companies. So you might be surprised to learn that, today, 50% of the Operating Committee members reporting to me are women as are approximately 30% of our firm's senior leadership globally. They run major businesses – several units on their own would be among Fortune 1000 companies. In addition to having five women on our Operating Committee – who run Asset & Wealth Management, Finance, Global Technology, Legal and Human Resources – some of our other businesses and functions headed by women include Consumer Banking, Credit Card, U.S. Private Bank, U.S. Mergers & Acquisitions, Global Equity Capital Markets, Global Research, Global Custody, Regulatory Affairs, Global Philanthropy, our U.S. branch network, our Controller and firmwide Marketing. 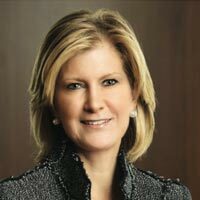 I believe we have some of the best women leaders in the corporate world globally. In addition to gender diversity, 48% of our firm’s population is ethnically diverse in the United States. We are proud of JPMorgan Chase’s industry recognition for its diversity and inclusion efforts. In 2017, we received more than 50 awards that recognize the firm and represent the diversity of our employees. In 2016, we introduced Advancing Black Leaders (ABL), an expanded diversity strategy focused on increased hiring, retention and development of talent from within the black community. This specifically recognized that — with this population — we should and could do more. We set up a separate group whose sole purpose is to help do this better. From training to retention to recruiting and hiring new employees, our intensified efforts are starting to pay off. Two years into this initiative, we are seeing encouraging results. At executive levels, we closed 2017 with a noticeable increase in headcount (97 black managing directors globally, up from 83 a year earlier), driven by recruiting new talent and promoting existing talent. In addition, we are seeing positive headcount gains in our pipeline for mid-level managers over the last two years, with executive director representation up 30%, emerging talent with vice president representation up 17% and student talent up 7%. To encourage dialogue and engage our people, more than 85,000 employees were invited to participate in ABL Dialogues — a series of interactive panel discussions facilitated by local leaders in 10 U.S. strategic hubs. We recently developed a few additional plans and goals for this effort, which we believe will improve these results dramatically. 5. Transparency, financial discipline and a fortress balance sheet. Why is this discipline so important? Our bank operates in a complex and sometimes volatile world. We must maintain a fortress balance sheet if we want to continually invest and support our clients through thick and thin. A fortress balance sheet also means clear, comprehensive, accurate financial and operational reporting so we can properly manage the company, particularly through difficult times. We are fanatical about measuring our results — financial and operational. We set targets for ourselves, and we always compare ourselves with our competitors. These targets are what we hope to achieve over the medium term and after making proper investments for the future, such as adding bankers and enhancing technology. 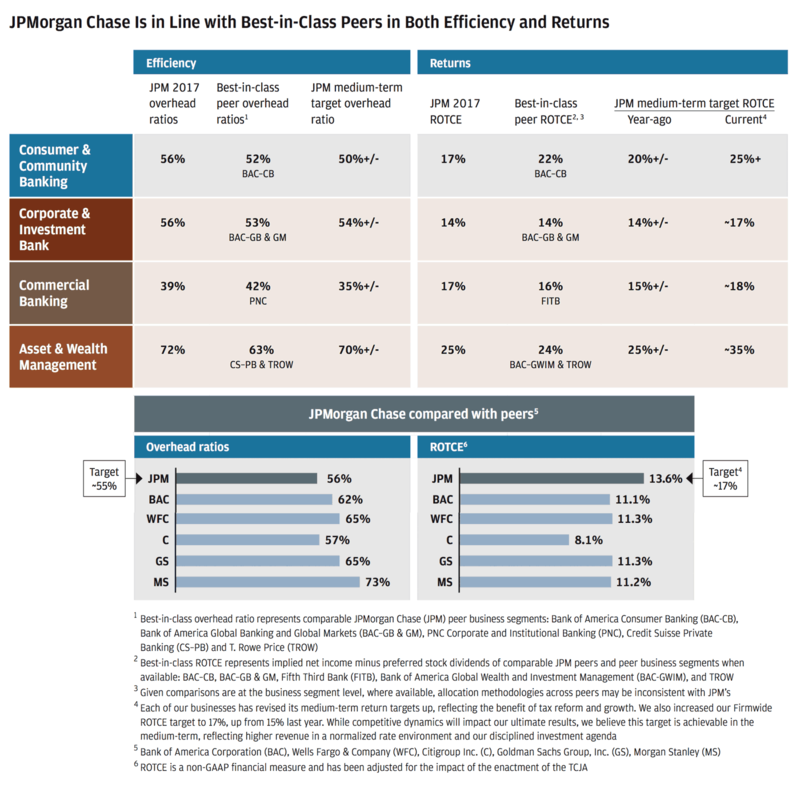 The chart below shows that we generally compare well with our best-in-class peers (we never expect to be best-in-class every year in every business). You should assume we do this internally at a far more detailed level than what is presented here. We need a fortress balance sheet so we can continue to do our job — regardless of the environment. The next two charts below show the extraordinary strength of our balance sheet. We have always believed that maintaining a strong balance sheet (including liquidity and conservative accounting) is an absolute necessity. The Federal Reserve’s Comprehensive Capital Analysis and Review (CCAR) stress test estimated what our losses would be through a severely adverse event lasting over nine quarters — an event that is worse than what actually happened during the Great Recession; e.g., high unemployment and counterparty failures. The Fed estimated that in such a scenario, we would lose $18 billion over the ensuing nine quarters, which is easily manageable by JPMorgan Chase’s capital base. 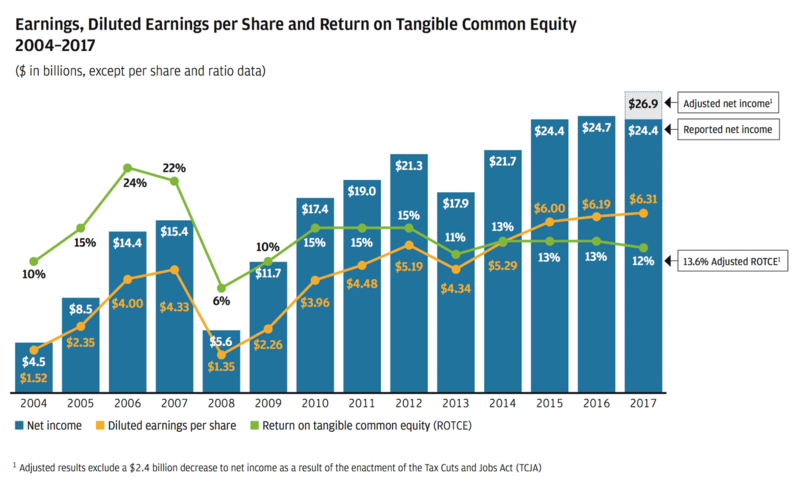 My view is that we would make money in almost every quarter in that scenario, and this is supported by our having earned approximately $30 billion pre-tax over the course of the nine quarters during the actual financial crisis of 2009. We are believers in the CCAR stress testing process, although our view is that it could be simplified and improved. Our shareholders should know that the CCAR stress test is only an annual test. To explain how serious we are about stress testing, you should know that we run several hundred tests a week — including a number of complicated, potentially disastrous scenarios – to prepare our company for almost every type of event. While we never know exactly how and when the next major crisis will unfold, these rigorous exercises keep us constantly prepared. 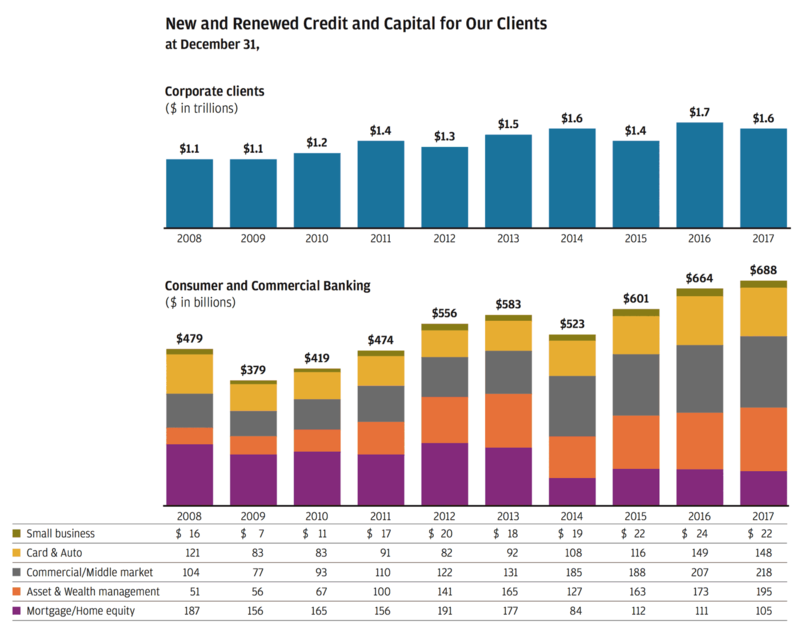 The chart above shows just how much capital is retained by the CCAR banks. To remind you, CCAR forecasts the losses of each bank over the next nine quarters as if all of them went through a crisis worse than the crisis in 2009 and that each bank performed as poorly as the worst bank throughout that crisis. 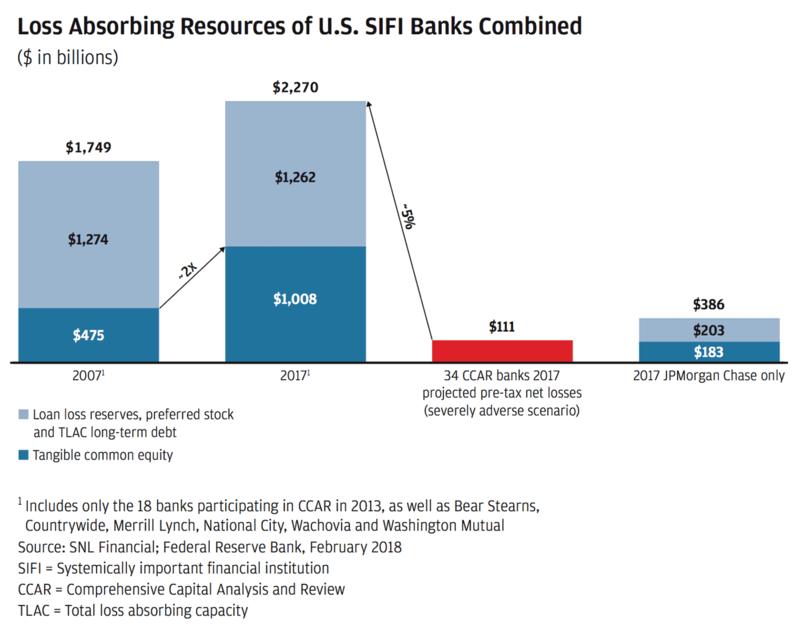 The chart above also shows that even in the extremely unlikely event that it could happen this way (i.e., that each bank is the worst bank), there is plenty of capital in the system to absorb these events. This does not include the fact that the new regulatory requirements would appropriately force any bank to take corrective action long before it gets into serious trouble. 6. What risks worry us the most? And what could go wrong? The global economy across Asia and Japan, Latin America and Europe, and the United States has been doing well — better than most would have expected a year ago. The United States in particular may be strengthening as we speak. The competitive tax system, a more constructive regulatory environment, and very high consumer and business confidence are increasing indications that the economy will likely expand. Unemployment may very well drop to 3.5% this year, and there are more and more signals that business will improve capital expenditures and raise payrolls. Credit is readily available (though still not enough in some mortgage markets). Wages, jobs and household formation are increasing. Housing is in short supply. Underlying consumer and corporate credit have been relatively strong. All these signs lead to a positive outlook for the economy for the next year or so. I will not spend time dwelling on geopolitics here, which can – but rarely does – upset the global economy. In the next section, I talk about serious policy issues that could harm economic growth, including America’s relationship with China and potential disruptions to global trade. In this section, I focus on some of the risks in the financial system and how we go about managing them. We will be prepared for Brexit. So far, it has turned out pretty much like we expected: It’s complex and hard to figure out, and the long-term impact to the United Kingdom is still uncertain. Last year, we spoke about whether Brexit would cause the European Union to unravel or pull together — and it appears, particularly with the new leadership in France and the steady hand in Germany, that the countries might pull together. As for JPMorgan Chase, fortunately, we have the resources to be prepared for a hard Brexit, as we must be. It essentially means moving 300-400 jobs around Europe in the short term and modifying some of our legal entities to be able to conduct business the day after Brexit. What we do not know — and will not know until the negotiations are complete — is what the end state will look like. Although unlikely, there is the possibility that we could stay exactly as we are today. Unfortunately, the worst outcome would be much of London’s financial center moving to the Continent over time. We hope for all involved that this outcome will not be the case. We cannot do enough as a country when it comes to cybersecurity. I cannot overemphasize the importance of cybersecurity in America. This is a critical issue, not just for financial companies but also for utilities, technology companies, electrical grids and others. It is an arms race, and we need to do whatever we can to protect the United States of America. Our bank is extremely good at cybersecurity and client protection. However, cyber law in the United States is inadequate regarding banks and government entities. We need to be allowed to work even closer with our government in real time to properly protect the financial system. In addition, we need to have better international cyber laws (and include them in trade agreements) like we do in maritime and aviation laws. Countries should know what they are responsible for – and what redress companies or countries have – when either a bad state actor or criminals in a state cause extreme problems. In the financial markets, we must be prepared for the full range of possibilities and probabilities. We strive to try to understand the possibilities and probabilities of potential outcomes so as to be prepared for any outcome. We analyze multiple scenarios (in addition to the stress testing I wrote about earlier in this section). So regardless of what you think about the probabilities, we need to be prepared for the possibilities, including the worst case. In essence, we try to manage the company such that all possibilities, including the “fat tails” (the worst-case scenarios), cannot hurt the company. We try to intelligently, thoughtfully and analytically make decisions and manage risk (and not overly rely on models). When I hear people talk about banks taking risks, it often sounds as if we are taking big bets like you would at a casino or a racetrack. This is the complete opposite of reality. Every loan we extend is a proprietary risk. Every new facility we build is a risk. Whether we are adding branches or bankers — or making markets or expanding operations – we perform extensive analytics and stress testing to challenge our assumptions. 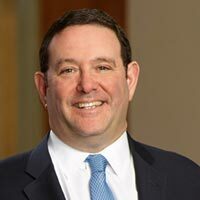 In short, we look at the best- and worst-case scenarios before we “take risk.” Much of what we do as a bank is to mitigate or manage the risk being taken. I think you would be impressed by the thoroughness and risk-mitigating approach demonstrated at our risk committee meetings. At these meetings, we have lawyers, compliance, risk management, bankers and technologists — folks with decades of experience who challenge each other and ensure we have thought about every possible angle. And since we know we will be wrong sometimes, we almost always look at the worst possible case — to ensure JPMorgan Chase can survive any situation. This is not risk taking on the order of taking a guess — it is intelligent, thoughtful, analytical decision making. There are other items – but you get the point. Judgment (which will never be perfect all of the time) cannot be removed from the process. Volatility and rapidly moving markets should surprise no one. We are always prepared for volatility and rapidly moving markets – they should surprise no one. I am a little perplexed when people are surprised by large market moves. Oftentimes, it takes only an unexpected supply/demand imbalance of a few percent and changing sentiment to dramatically move markets. We have seen that condition occur recently in oil, but I have also seen it multiple times in my career in cotton, corn, aluminum, soybeans, chicken, beef, copper, iron — you get the point. Each industry or commodity has continually changing supply and demand, different investment horizons to add or subtract supply, varying marginal and fixed costs, and different inventory and supply lines. In all cases, extreme volatility can be created by slightly changing factors. It is fundamentally the same for stocks, bonds, and interest rates and currencies. Changing expectations, whether around inflation, growth or recession (yes, there will be another recession — we just don’t know when), supply and demand, sentiment and other factors, can cause drastic volatility. One scenario that we must be prepared for is the possibility that the reversal of quantitative easing (QE) by the world’s central banks — in a new regulatory environment — will be different from what people expect. The United States has had subpar economic growth over the last eight years (I believe this is due to a lot of poor policy decisions that I discuss in the next section), as well as new demographic realities. Our growth cumulatively in this expansion has been about 20%, while a more normal recovery would have seen growth of over 40% by now. However, with recent reforms, the situation may be improving. As inflation, wages and growth seem to be modestly increasing, the Federal Reserve has started to raise interest rates and reverse QE. Importantly, as long as rates are rising because the economy is strengthening and inflation is contained, it is reasonable to expect that the reversal of QE will not be painful. The benefits of a strong economy are more important than the negative impact from modest increases in interest rates. Since QE has never been done on this scale and we don’t completely know the myriad effects it has had on asset prices, confidence, capital expenditures and other factors, we cannot possibly know all of the effects of its reversal. We have to deal with the possibility that at one point, the Federal Reserve and other central banks may have to take more drastic action than they currently anticipate — reacting to the markets, not guiding the markets. A simple scenario under which this could happen is if inflation and wages grow more than people expect. I believe that many people underestimate the possibility of higher inflation and wages, which means they might be underestimating the chance that the Federal Reserve may have to raise rates faster than we all think. While in the past, interest rates have been lower and for longer than people expected, they may go higher and faster than people expect. If this happens, it is useful to look at how the table is set — what are all the things that are different or better or worse than during prior crises, particularly the last one — and try to think through the possible effects. Far more money than before (about $9 trillion of assets, which represents about 30% of total mutual fund long-term assets) is managed passively in index funds or ETFs (both of which are very easy to get out of). Some of these funds provide far more liquidity to the customer than the underlying assets in the fund, and it is reasonable to worry about what would happen if these funds went into large liquidation. Even more procyclicality has been built into the system. Risk-weighted assets will go up as will collateral requirements – and this is on top of the procyclicality of loan loss reserving. Market making is dramatically smaller than in the past (e.g., aggregate primary dealer positions of bonds — including Treasury and agency securities, mortgage-backed securities and corporates — averaged $530 billion in 2007 vs. an average of $179 billion today). While in the past that total may have been too high, virtually every asset manager says today it is much harder to buy and sell securities, particularly the less liquid securities. Liquidity requirements, while much higher, now have an element of rigidity built in that did not exist before. Banks will be unable to use that liquidity when they most need to do so — to make loans or intermediate markets. They have a “red line” they cannot cross (they are required to maintain hard and fast liquidity requirements). As clients demand more liquidity from their banks, the banks essentially will be unable to provide it. There has been an excessive reliance on models (which I spoke about earlier in this section). The continuous politicization of complex policy is an issue. No one can believe that very detailed and complex global liquidity or capital requirements should be set by politicians. No banks to the rescue this time — banks got punished for helping in the last go-round. It would be a reasonable expectation that with normal growth and inflation approaching 2%, the 10-year bond could or should be trading at around 4%. And the short end should be trading at around 2½% (these would be fairly normal historical experiences). And this is still a little lower than the Fed is forecasting under these conditions. It is also a reasonable explanation (and one that many economists believe) that today’s rates of the 10-year bond trading below 3% are due to the large purchases of U.S. debt by the Federal Reserve (and others). This situation is completely reversing. Sometime in the next year or so, many of the major buyers of U.S. debt, including the Federal Reserve, will either stop their buying or reverse their purchases (think foreign exchange managers or central banks in Japan or China and Europe). So far, only one central bank, the Federal Reserve, has started to reverse QE — and even that in a minor way. However, by the end of this year, the Fed has indicated it might reduce its holding of Treasuries by up to $150 billion a quarter. And finally, the U.S. government will need to sell more than $250 billion a quarter to fund its deficit. There are two offsetting factors to the large sales of Treasuries. One is that as the Federal Reserve sells, it reduces excess reserves, which requires banks to buy Treasuries to meet liquidity requirements. But we do not fully know the extent of this scenario, and it certainly won’t be dollar for dollar. The second factor, as some argue, is that the U.S. trade deficit effectively forces foreign countries to use their dollars to buy Treasuries, although this is not completely true — they can buy other U.S. securities or assets or sell their dollars. So we could be going into a situation where the Fed will have to raise rates faster and/or sell more securities, which certainly could lead to more uncertainty and market volatility. Whether this would lead to a recession or not, we don’t know — but even that is not the worst case. If growth in America is accelerating, which it seems to be, and any remaining slack in the labor markets is disappearing — and wages start going up, as do commodity prices — then it is not an unreasonable possibility that inflation could go higher than people might expect. As a result, the Federal Reserve will also need to raise rates faster and higher than people might expect. In this case, markets will get more volatile as all asset prices adjust to a new and maybe not-so-positive environment. Remember that former Chairman of the Federal Reserve Paul Volcker increased the discount rate by 100 basis points on a Saturday night back in 1979 in response to a serious double-digit inflation problem. And when markets opened the next business day, the Fed funds rate went up by over 200 basis points. Also remember that the Federal Reserve is operating with extremely different monetary transmission mechanisms than in the past. The old “money multiplier” has been superseded by the new capital and liquidity requirements. Today’s “excess reserves” (reserves once considered in excess of what banks were required to post in cash at the Federal Reserve – fundamentally reserves that could be lent out) are not lendable, although we still don’t completely understand the effect of this. There is a risk that volatile and declining markets can lead to market panic. Financial markets have a life of their own and are sometimes barely connected to the real economy (most people don’t pay much attention to the financial markets nor do the markets affect them very much). Volatile markets and/or declining markets generally have been a reaction to the economic environment. Most of the major downturns in the market since the Great Depression reflect negative future expectations due to a potential or real recession. In almost all of these cases, stock markets fell, credit losses increased and credit spreads rose, among other disruptions. The biggest negative effect of volatile markets is that it can create market panic, which could start to slow the growth of the real economy. The years 1929 and 2009 are the only real examples in the United States in the past 100 years when panic in the markets caused large reductions in investments and hiring. I wouldn’t give this scenario very high odds — in fact, I would give it low odds. Most people think of those events as one-in-a-thousand-year floods. But because the experience of 2009 is so recent, there is always a chance that people may overreact. If truly negative events started to unfold, we could expect the Federal Reserve, with its enormous authority and power, to take strong action, including changing regulations, if the Fed thought it necessary. In any event, our shareholders should rest assured that we will weather it all. There are a couple of things we all could do to be more prepared for this situation and other disruptions, which I will discuss in the next few paragraphs. Banks and regulators need to be more forward looking and less backward looking — particularly when examining risks across the system. One day there will be another crisis, and financial institutions and central banks will need to respond. The financial system is far more safe and sound than in the past. But in spite of all the regulations put in place, I worry about whether we have properly prepared for the next crisis. The Financial Stability Oversight Council was created to oversee the whole system (as appropriate), but we have not yet really worked collaboratively to prepare tabletop exercises about what would happen across the system under difficult situations. When the next crisis begins, regardless of where or how it starts, multiple actors in the system will take actions — either out of necessity (i.e., they need cash) or sentiment (i.e., they want to reduce risk). This will happen across passive, index and ETF funds, insurance companies, banks and nonbanks. As individual actors stop providing credit and liquidity in the marketplace, we need to do a better job of understanding how this might unfold. And all this will be happening under a different regulatory regime from before. Modest regulatory reform can strengthen the financial system, improve the functioning of our markets and enhance economic growth for all Americans. While the regulatory environment is appropriately much stricter than it once was, we can simplify it and even strengthen it by ensuring that it is globally fair and transparent and includes continuous, regular review and appropriate modification. Regulators now have begun to simplify, coordinate and reduce overlapping regulations. I won’t repeat the details that I’ve discussed in prior letters — many of them were also discussed in Treasury reports issued by the government. But suffice it to say, modest regulatory reform could allow banks to expand carefully, improve access to credit (e.g., mortgages and small business loans) and improve market making and the functioning of the money markets. 7. How is the company dealing with bureaucracy and complacency that often infect large companies? After years of increasing regulations, there has been a temptation to blame some of our bureaucracy and ridiculous processes on regulations. That, too, is (mostly) hogwash. It is easy to find excuses not to attempt to reimagine how things could be done better and more efficiently. Meetings. Internal meetings can be a giant waste of time and money. I am a vocal proponent of having fewer of them. If a meeting is absolutely necessary, the organizer needs to have a well-planned, focused agenda with pre-read materials sent in advance. The right people have to be in the room, and follow-up actions must be well-documented. Just as important, each meeting should only run for as long as it needs to and lead to real decisions. In addition, there should be clarity around who chairs the meeting. The chair is responsible for making sure all issues are properly raised, facilitating effective and productive discussions and driving to decisions. War rooms. Just as important, we need to simplify our processes while accelerating the pace of change and driving new innovations. Last year, the Operating Committee created a number of “war rooms” – spanning lines of business, geographies, functions and levels — to make our firm more agile and to put a laser focus on several hot-button issues, like client onboarding and vendor and third-party management. Each war room is staffed with a dedicated group of employees tasked with solving specific problems within a set number of weeks or months. You would be amazed at how quickly our employees can come up with new solutions when they are galvanized around solving a problem in a concentrated time period. These teams have been so successful in driving bureaucracy out of the decision-making process that we plan to deploy more war rooms when critical needs arise. These war rooms are very similar to how we operated when we made complex acquisitions. Essentially, they cause better and faster dissemination of information to those who need to know – and faster and more productive decision making because everyone involved is in the room. Reimagining. You can take any part of your business and reimagine it. You can get all the right people in the room to think about a certain process and reimagine how it could be done from the ground up. Our Know Your Customer problem-solving team is a good example of the results our reimagining and war rooms can drive. Comprising all lines of business, the group was given eight weeks to reimagine our KYC processes to improve the customer experience without sacrificing controls. By applying a sharp, firmwide focus to the KYC protocols, the team identified several KYC questions and protocols that had become outdated or been made redundant by recent controls. One customer could be subjected to multiple KYC processes depending on the line of business and channel used. As a result, the team streamlined KYC questions substantially and identified a number of processes that could be eliminated, which will allow for a better customer experience while still maintaining a strong control environment. This war room team’s results not only helped disparate lines of business identify duplicative processes but also enabled the team to update the firm’s priorities. Fighting complacency by being self-critical. Complacency is another disease. It is usually borne out of arrogance or success, but it is a guarantee of future failure. Our competitors are not resting on their laurels — nor can we. The only way to fight complacency is to always analyze our own actions and point out our own weaknesses. It’s great to openly celebrate our successes, but when the door is closed, management should emphasize the negatives. Using agile management to create speed. Agile technology generally means using new forms of technology — think cloud computing, for example – to enable small teams of programmers to build and properly execute new programs and products rapidly and effectively. The concept of agile management goes hand in hand with this approach. Small teams of people responsible for products and services work with technologists to improve the customer experience. To do this, they must be given the necessary authority and resources. It is also important they understand that they can make mistakes without punishment. 8. What are the firm’s views on succession? Having a first-rate management team in place is probably the Board’s highest priority. Therefore, management succession planning is a key focus of our Board. The Board knows the firm’s senior leaders well, through unfettered access and significant interaction. While the Board and I have agreed that I will continue in my current role for approximately five more years, we both believe that, under all timing scenarios, the firm has in place several highly capable successors. Early in the year, we announced that Daniel Pinto, CEO of our Corporate & Investment Bank, and Gordon Smith, CEO of Consumer & Community Banking, have been appointed Co-Presidents and Chief Operating Officers of the company. In addition to their current roles, Daniel and Gordon will work closely with me to help drive critical firmwide functions. 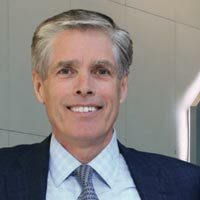 Our other outstanding CEOs, Mary Erdoes, Asset & Wealth Management, and Doug Petno, Commercial Banking, along with our CFO, Marianne Lake, took on expanded responsibilities last year and have played progressively more significant roles partnering across the firm in helping to manage the company. I also want to say how grateful I am to our Operating Committee and to all of the leaders of our organization for the extraordinary job they do. The following messages are worth repeating from last year’s letter: The United States needs to ensure that we maintain a healthy and vibrant economy. This is what fuels job creation, raises the standard of living and creates opportunity for those who are hurting, while positioning us to invest in education, technology and infrastructure – in a programmatic and sustainable way — to build a better and safer future for our country and its people. And in a world with so many security threats and challenges, we need to maintain the best military. America’s military will be the best in the world only as long as we have the best economy in the world. Business plays a critical role as an engine of economic growth — particularly our largest, globally competitive American businesses. As an example, the 1,000 largest companies in America (out of approximately 29 million) employ nearly 30 million people in the United States, and nearly all of their full-time employees receive full medical and retirement benefits, as well as extensive training. In addition, these companies account for more than 30% of the roughly $2.3 trillion spent annually on capital expenditures. These expenditures and research and development spending drive productivity and innovation, which, ultimately, drive job creation across the entire economy. Of the approximately 150 million people who work in the United States, 130 million work in private enterprise. We hold in high regard the 20 million people employed by the government or in the public sector — teachers, police officers, firefighters and others. But we could not pay for those jobs if the other 130 million workers were not actively producing America’s gross domestic product (GDP). Small businesses are a critical engine of economic growth. Small and large businesses are symbiotic — they are each other’s customers, and they help drive each other’s growth. They are integral to our large business ecosystem. At JPMorgan Chase, for example, we support more than 4 million small business clients, including hundreds of small banks, 15,000 middle market companies, and approximately 7,000 corporations and investor clients. Additionally, we rely on services from nearly 30,000 vendors, many of which are small and midsized companies. Let’s take another look at what is holding us back and some solutions that could make life better for all Americans. 1. What has gone wrong in public policy? In the last several years, I have spent a good amount of time — in both these letters and elsewhere — talking about public policy. Some of the policies directly relate to JPMorgan Chase, while others are more indirect but have a large effect on the future of the United States of America, on the global economy and, therefore, on our company. With all of America’s exceptional strengths, it seems clear to me that something is holding us back. As we have already pointed out, our economic growth has been anemic. Our economy has grown approximately 20% in the last eight years, but this stands in contrast with prior average recoveries where growth would have been more than 40% over an eight-year period. Last year, I laid out in detail an extensive list of things I thought were holding us back, and it bears repeating here because, just as it took many years for these obstacles to develop, it is going to take sustained effort over many years to right the course. When you look at this list in totality, it is significant and fairly shocking. Most of these areas have become consistently worse over the last 10 to 20 years, and it is hard to argue that they did not meaningfully damage the country’s economic growth. It is also important to point out that I have never seen an economic model that accounts for the extremely damaging aspects of these items. (These items don’t include the trillions of dollars we have spent on war-related expenditures. And whether you were for or against these wars, they certainly did not add to American productivity.) This is not secular stagnation — this represents senseless and misguided policies. We had a hugely and increasingly uncompetitive tax system driving companies’ capital and brainpower overseas. Excessive regulations for both large and small companies reduced growth and business formation. 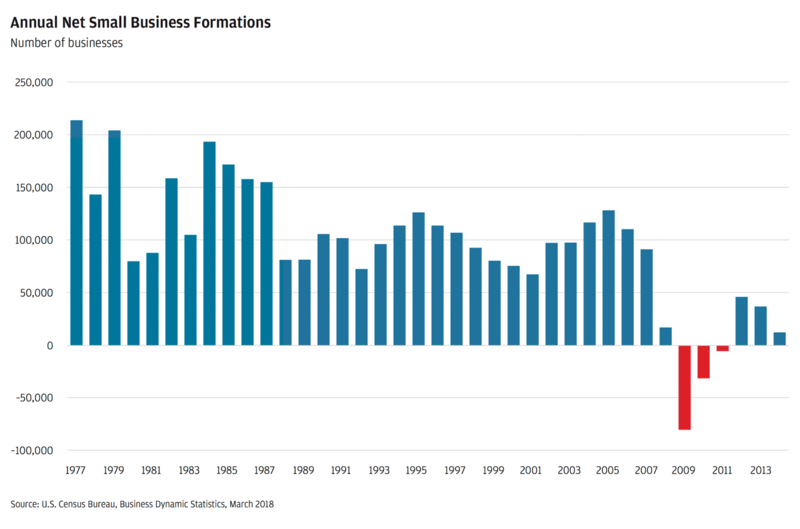 The ease of starting a business in the United States worsened, with small business formation dropping to the lowest rate in 30 years. The chart above (on the right) shows how tepid bank credit growth was in general during this recovery. 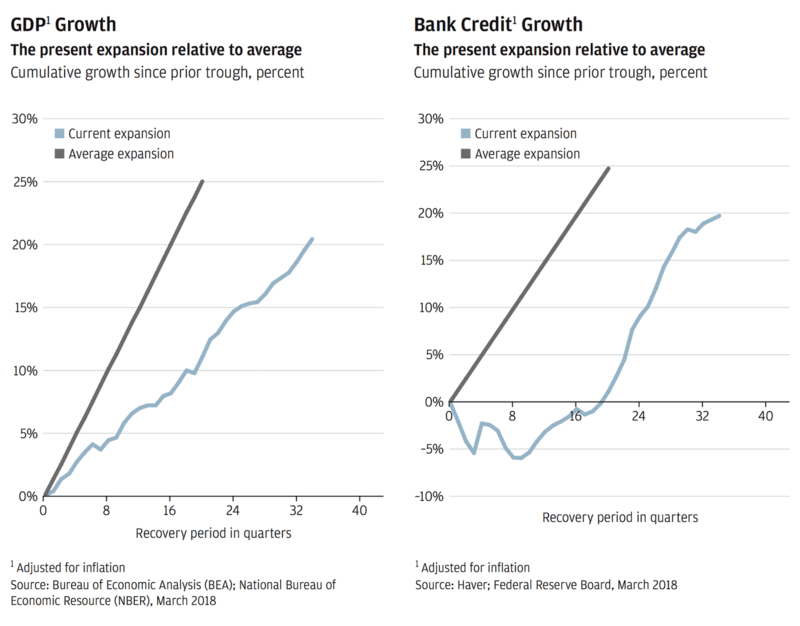 Remember, bank credit growth directly relates to economic growth, although it’s often difficult to figure out the cause and effect. But there is no question that the things that reduce credit availability, in turn, reduce growth. One area where we know this happened was in the mortgage market. Household formation has been slow because many young adults have had a difficult time finding work and, with the help of their families, have gone back for more schooling. That is slowly reversing. But the inability to reform mortgage markets has dramatically reduced mortgage availability. In fact, our analysis shows that, conservatively, more than $1 trillion in mortgage loans might have been made over a five-year period. Labor force participation — particularly among men aged 25-54 — dropped dramatically. An estimated 2 million Americans are currently addicted to opioids (in 2016, a staggering 42,000 Americans died because of opioid overdoses), and some studies show this is one of the major reasons why men aged 25-54 are permanently out of work. Even worse, 70% of today’s youth (ages 17-24) are not eligible for military service, essentially due to a lack of proper education (basic reading and writing skills) or health issues (often obesity or diabetes). Our nation’s healthcare costs are twice the amount per person compared with most developed nations. Our litigation system is increasingly arbitrary, capricious, wasteful and slow. Economic analysis provides a sense of the costs associated with misguided policies. The Congressional Budget Office estimates the cost of failing to pass immigration reform earlier this decade at 0.3% of GDP a year. An International Monetary Fund study suggests that a 1% of GDP rise in infrastructure investment in 2013 would have delivered a similar boost to advanced economy GDP over the subsequent decade. J.P. Morgan analysis indicates that the cost of not reforming the mortgage markets could be as high as 0.2% of GDP a year. Taken together with the costs of excessive regulation and a depressed prime age labor participation rate, it is easy to conclude that corrections in policy could add more than 1% of GDP annually. And this does not account for many of the items I mentioned in the prior list. The end result is that our economy is still leaving many behind. Much of this is probably self-inflicted. While a job used to provide a ticket to the middle class, today more people are getting stuck in low-wage work. Historically, we’ve thought of these jobs as providing the first rung on a career ladder — a chance for workers to prove themselves and develop skills before moving on to other, better paying jobs. But a growing number of Americans are left hanging on this first rung: During the mid-1990s, only one in five minimum-wage workers was still at minimum wage a year later. Today, that number is nearly one in three. So while the economy has not performed badly and has done amazingly well for a handful — low-skilled and even middle-skilled wages have gone down, leaving large swaths of Americans behind. It is surprising that many younger people in the United States, who are effectively going to inherit the wealthiest nation on the planet, seem to be pessimistic about our future and capitalism. But falling expectations, the failure of our economy to lift up everyone, and the continual deprecation of society and its leaders have led to huge amounts of discontent and unrest. All these issues are fixable, but we should ask ourselves how we got it wrong in the first place. 2. Poor public policy — how has this happened? The world is getting faster and more complex, making speed and analytics all the more important. But the structure of our political parties and institutions has barely changed in 100 years. They may not be set up for success — organized in a way to enable them to deal with today’s challenges. Critical thinking, analysis of facts and proper policy formation have become extremely difficult in a politicized and media-saturated environment. Often, politics misuses facts to justify a position. We are effectively crippled when it comes to fixing our problems even when they are totally predictable. Puerto Rico’s bankruptcy, Detroit’s bankruptcy, unfunded pension plans, the job skills gap, and crumbling bridges and tunnels are prime examples. We focus too much on the short term. For example, President Bill Clinton (and I don’t mean to pick him out specifically) usually gets credit for driving a strong economy. But the excessive mortgage lending, incented and promulgated by the federal government (I am in no way saying that banks and investors didn’t play a part, too), is part of the reason the economy at that time did well. It blew up late in President George W. Bush’s term. There are many examples of presidents getting credit or blame for scenarios that had nothing to do with their governing. We simply learned the wrong lessons. And in the short run, we tend to simplistically look for scapegoats instead of solutions. Rogoff and Reinhart wrote in their book, This Time Is Different, that it takes a long time to recover from a financial crisis. But this was often due to poor policy or overreaction to the financial crisis, and while history teaches us that maybe we should expect this reaction in the next crisis, it does not have to be true over and over. We have a difficult time learning from the past. A famous politician once said, “Don’t let a good crisis go to waste.” I think he really meant, “Let’s use the crisis to get some good, important things done.” It appears that politicians sometimes use a crisis to justify implementing their own agenda. 3. We can fix this problem through intelligent, thoughtful, analytical and comprehensive policy. Binary arguments. When people argue as if there are binary solutions, the argument is almost always wrong. When people say you should not do something because it is like going down a “slippery slope,” it generally is not a good argument. In the modern world, there are reasons to calibrate various parts of policy instead of just denying the argument altogether. “They complain too much” arguments. When a point has been made and someone calls it a complaint, the point is diminished right away. When someone complains about something, a better response is to think about where or how the person might be right or partially right. Not listening to one another. I tell my liberal friends to read columnists like Arthur Brooks and George Will. And I tell my conservative friends to read writers like Tom Friedman. Not asking what outcomes you really want to achieve. Not working with experts who know the most about a subject. Trying to create too many zero-tolerance environments when they are often not merited. Examples include situations where people need to be able to communicate with each other and work through miscommunications and mistakes of judgement rather than criminal and unethical behavior, where a zero-tolerance standard should be applied equally to all. This way of thinking also applies to institutions. We should not destroy the credibility or the effectiveness of institutions — public or private — for the mistakes or misdeeds of a few. This may feel good in the short term but will not serve us well over the long term. We all generally know what a good decision-making process looks like — and we applaud it — whether in business or in Congress. 4. The need for solutions through collaborative, competent government. People don’t think about the challenges in their everyday lives as being Democratic or Republican issues — and our political leaders need to stop thinking that way. We need a well-performing, competent government to thrive as a nation. Clearly, there are things that only the government can do — and must do well — such as having a strong military and ensuring an efficient and properly functioning justice system. The federal government maintains most of our nation’s transportation systems, and we need state and local governments to do a good job in terms of education, policing and other important functions. Some argue that the government should be doing more. But when many Americans think of the government delivering services, they think of the endless bureaucracy and paperwork associated with the Internal Revenue Service, the U.S. Postal Service and the Department of Veterans Affairs — none of which would consistently get high marks. We all can agree that the lack of true collaboration and an unwillingness to address our most pressing policy issues have contributed to the divisive and polarized environment we have today. Certainly there is plenty of blame to go around on this front. However, rather than looking back, it now is more important than ever for the business community and government to come together to find meaningful solutions. This cannot be done by government or business alone. Many examples of business and government working together already have produced positive outcomes. Businesses have played a large role in trying to help Detroit recover. Businesses started the Veteran Jobs Mission. With a goal of 1 million jobs, the coalition of businesses has already helped 400,000 U.S. veterans get work, and the number is still growing. Many businesses have worked closely with the education system (mostly locally) to support charter schools, vocational schools and community colleges to provide skills training that prepares students for productive employment. We believe that collaboration can create even better outcomes in education, healthcare and job creation while shoring up pension plans and rebuilding our cities and communities across the nation. Our Founding Fathers studied and worked hard to design a strong and permanent democracy. They perfected a Constitution to protect our basic liberties, building in protections to temper some of our worst attributes and incent our best ones. If they were here with us today, I believe they would recognize that our government institutions are stuck in the mud — too slow and inadequate for the job at hand. Therefore, they would study and work hard within the Constitution to redesign and reformulate how government should function so that it works properly. We will eventually need to do the same. 5. A competitive business tax system is a key pillar of a growth strategy. It isn’t easy to stay competitive in an increasingly global marketplace, and national tax policy was one critical area where we were falling behind. Over the last 20 years, as the world reduced its tax rates, America did not. Our previous tax code was increasingly uncompetitive, overly complex, and loaded with special interest provisions that created winners and losers. This was driving down capital investment, reducing productivity and causing wages to remain stagnant. The good news is that the recent changes in the U.S. tax system have many of the key ingredients to fuel economic expansion: a business tax rate that will make the U.S. competitive around the world; provisions to free U.S. companies to bring back profits earned overseas; and, importantly, tax relief for the middle class. The passage of tax reform is critical because strong businesses create jobs and higher wages. Before tax reform was passed, 76% of the CEOs of leading U.S. companies said they would increase hiring if tax reform were enacted, and 82% would increase capital spending — and we already are seeing these effects. Hundreds of companies like ours are stepping up by investing in their employees and in initiatives to address challenges facing communities. I must confess I don’t understand how anyone could believe an uncompetitive tax system would be good for the United States — whether the current economic environment was good or bad. The damage has been cumulative. Here is one example: A recent study by the accounting firm Ernst & Young found that under a 20% corporate income tax rate, U.S. companies would have acquired $1.2 trillion in cross-border assets during 2004-2016 instead of losing $510 billion in such assets to foreign buyers. Simply put, this means the United States would have kept 4,700 companies under U.S. ownership during the past 13 years if they had paid taxes at a rate competitive with other countries that have modernized their corporate tax codes. Today’s competitive U.S. corporate tax rate will reduce incentives for U.S. companies to relocate abroad or be purchased by foreign companies. There is a reason why it has taken 30 years for comprehensive tax reform to take place in this country: It is complicated work, and navigating competing interests is hard. I am pleased that we did the right thing — not the easy thing. Congress took a historic step in 2017 to reform America’s broken and outdated tax code. Coming together to get that work done shows that we can take on tough issues that have been holding us back. I believe tax reform will have both short- and long-term benefits. In the short term, we already are seeing some companies increasing capital expenditures, hiring and raising wages. Of course, that will not be enough to offset all the immediate benefits associated with tax reform. Some argue that the added cash flow going to dividends and buybacks is a negative — it is not. It simply represents capital finding a higher and better use than the current owner has with it. And that higher and better use will be reinvestment in companies, innovation, R&D or consumption. Thinking this is a bad thing is just wrong. Tax reform’s real benefit will be the long-term cumulative effect of retained and reinvested capital in the United States, which means more companies, innovation and employment will stay in this country. The United States should always aim to have a competitive business tax system. It should not be traded off against other objectives. The need for rational, thoughtful, consistent tax policy. The business tax system should be competitive — always — and not be traded off against anything else. I would consider this table stakes for having a healthy economy in the long run. We should build the infrastructure we need. (We should consider this table stakes, too.) There are many reports that highlight how less expensive it is in the long run to have better infrastructure. In fact, some studies show it is even more expensive to have bad infrastructure. We should have a progressive tax system (helping people on the lower end) that progressively taxes higher incomes, like mine. And, of course, no one wants to think about their money being misspent. Therefore, it is critical for Washington to show the American public that their money will be used wisely — and that includes canceling or modifying programs that don’t work and not using money to pay off special interest groups. If we need to raise taxes on the more well-off, I would hope the more affluent would recognize that they will do better if the country does better. The tax policy should be consistent in the long term for businesses to maximize their productivity and growth. This is the best way to permanently drive growth and become a far wealthier and fairer society. There are two things I would do immediately to improve income inequality and create a much healthier society as explained below. Here is some news we announced on how JPMorgan Chase is immediately putting some of the benefits of tax reform to good work. Along with a more constructive regulatory and business environment and our strong business performance, this reform has led our company to recently announce a $20 billion, five-year comprehensive investment to help its employees while supporting job and local economic growth in the United States. JPMorgan Chase plans to build up to 400 Chase branches in 15-20 new markets and hire up to 4,000 additional employees over the next five years. These employees will support our branch growth and more lending to small businesses and homeowners. Today, Chase has roughly 5,100 branches across 23 U.S. states, and, for a long time, we have wanted to expand beyond our current footprint. The heart of our company is our branches. We serve 61 million U.S. households — one out of every two U.S. families is a Chase customer. Nearly every line of business operates out of our branches in some way. We are not in some major markets, including Boston, Philadelphia and Washington, D.C., but Consumer Banking has started the formal application process for national expansion. As I previously said, when Chase enters a community, it enters with the full force of JPMorgan Chase behind it. We hire people. We lend to and support local businesses. We help customers with banking, lending and saving. And our philanthropic programs help make these communities stronger. Our company has made a significant economic impact in all the communities in which we operate, and we’re excited to become an even more relevant part of many others. We’re also investing in our employees. We want to have the best people, period. We know happy customers start with happy employees, and we want to be the best place to work everywhere we do business. For the second time in two years, we’re raising wages for 22,000 employees. For employees making between $12 and $16.50 an hour, we will raise hourly wages to between $15 and $18, depending on the local cost of living. This is the right thing to do, and we believe it puts us well above the average hourly wage for most markets. These increases are on top of the value of the firm’s full benefits package, which averages $12,000 for employees in this pay range. But the improvements won’t stop there. We’re reducing medical plan deductibles by $750 per year for employees making less than $60,000 — this essentially makes the deductible $0 for those employees who take care of themselves by meeting minimal wellness and preventative program requirements. Credit is essential to a healthy economy and growth, and our new investments include sizable increases in lending to small businesses and homeowners. Through Commercial Banking and Business Banking, we will hire 500 new bankers and help expand small business lending by 20% — or $4 billion — over three years while entering new markets. We’re also doubling the investment in our Small Business Forward initiative to $150 million over five years to help provide small businesses run by women, minorities and veterans get both the capital and technical assistance they need to grow. We will also help more families live their dream of owning a home by increasing home lending in low- and moderate-income communities by 25% to $50 billion — over the next five years. To do so, we will hire up to 500 new Home Lending advisors across our current markets and in some new ones. In addition, we will increase lending to finance affordable rental housing to $7 billion over five years. Today, our company is strong and growing, and when we grow, so do the communities where we do business. We’re excited to welcome new employees, new customers and new communities to JPMorgan Chase and to look forward to a bright future. 6. We should reform and expand the Earned Income Tax Credit and invest in the workforce of the future. There are some problems with the EITC. Paid as a tax credit at the end of the year, 21% of the people who are entitled to it don’t file for it — mostly because they don’t know about it. Additionally, there is some fraud involved. We should convert the EITC into more of a negative income payroll tax, which would spread the benefit, reduce fraud and get it into more people’s hands. (Both Democrats and Republicans favor a move like this.) We should also dramatically expand the tax credit and even make it more available to workers without children. Of the 150 million Americans working today, approximately 21 million earn between $7.25 an hour (the prevailing federal minimum wage) and $10.10 an hour. Approximately 42% of American workers make less than $15 an hour. It is hard to argue that you can live on $7-$10 an hour, particularly for families (even if two are working in that household). Decades ago, workers with very limited skills could earn a living wage to support themselves and their family. In this new highly technical world — where work skills are so greatly valued — the “natural” wage for unskilled workers may no longer lead to a living wage. This is an area that deserves more study. Jobs are a wonderful thing. Jobs bring dignity. That first job is often the first rung on the ladder. People like working, and studies show that once people start working, they continue working. Jobs and living wages lead to better social outcomes — more household formation, more marriages and children, and less crime, as well as better health and overall well-being. As society creates an enormous amount of wealth, expanding the EITC would be a very productive way to share it. If a large portion of the American population cannot earn a living wage, then we will create a situation of permanent social turmoil. We need to improve work skills and training that lead to better jobs — this will help both low- and middle-income workers. It is also the cure for rapid technological change. Many high schools and vocational schools do not provide the education our students need — the ability to graduate and get a decent job. We should be ringing the alarm bell, signaling that inner city schools are failing our children — often minorities and mostly lower income students. In many inner city schools, fewer than 60% of students graduate, and many of those who do are not prepared for employment. We are creating generations of citizens who never had a chance in this land of dreams and equal opportunity. Unfortunately, it’s self-perpetuating. And we all pay the price. According to an assessment of math and science scores that the Organisation for Economic Co-operation and Development (OECD) conducted in 35 advanced industrialized countries, the United States ranks, on average, #24. Making the investment to improve our performance to the level of the OECD average would increase the U.S. gross domestic product by 1.7% over the next 35 years. America used to be one of the best at training our workforce for good jobs. We know what to do to regain that mantle. We need to ensure that our high schools, vocational schools, technical schools and community colleges work together with local businesses to properly train these students so they can get well-paying jobs upon graduation; then we need to make sure proper apprenticeships and certifications (including college credits) are widely available. These students can continue to work or have the opportunity to go back to college, if they so choose. Doing this well will help the lower skilled and middle-income workers in the new world. The best way to offset any negatives associated with trade or technology is through continued education and training so that well-paying jobs are replaced with other well-paying jobs. We know that technological advancements are displacing certain industries. Driverless cars, for example, are getting closer to mainstream use every day. Technology will bring innovation, but it will also change the employment opportunities available to hundreds of thousands — perhaps even millions — of people. We have the opportunity, now, to start preparing for and addressing potential future job losses. Anticipating problems that may arise from new technologies — and developing plans to responsibly minimize them — should be considered the final phase of our R&D process. We, as a country, must also change the way we think about education. In less mutable times, a degree meant that formal learning was complete. You had acquired what you needed for a successful career in your field. A degree in today’s world cannot mean the end of your studies. New discoveries, new advancements, new technologies and new terminology all mean that a degree will not carry you as far into the future as it once did. We must place a higher premium on lifelong learning. Corporations can do a lot to encourage and foster such a shift. We should celebrate the benefits of technology, and we should also prepare for its challenges. Overall, technology is the greatest thing that has ever happened to mankind. It is the reason why we enjoy our high living standard. It is staggering how our lives have changed when compared with 100 years ago. We live longer and work less; we are healthier and safer; and during that time period, billions of people have been pulled out of poverty. People legitimately worry that technology will eliminate jobs as artificial intelligence replaces drivers, call center operators, etc. And this is no doubt true. But this has actually been happening for a long time. For instance, back in 1900, 41% of the U.S. workforce made their living in agriculture. Today, it is under 2%. This is only one example, but our vibrant economy has always found a way to adjust to job loss by creating new jobs and sometimes changing the way we work by reducing work days and work hours. We know technology has been a great force, and for the benefit of mankind, that force should be left unleashed. In the event that it creates change faster in the future than it has in the past — and the economy is unable to adjust jobs fast enough — the best protection is continual workforce training, education and re-education, supplemented by income assistance and relocation. 7. America’s growing fiscal deficit and fixing our entitlement programs. America’s net debt currently stands at 77% of GDP (this is already historically high but not unprecedented). You can see in the chart below that the debt level continues to get worse, but at an accelerated pace over the ensuing decades. We have time to fix it, so I am not immediately concerned. But this problem will not age well, and the sooner we start to fix it, the better. If we don’t fix the growing deficit situation, it will adjust itself and in a way we won’t like. 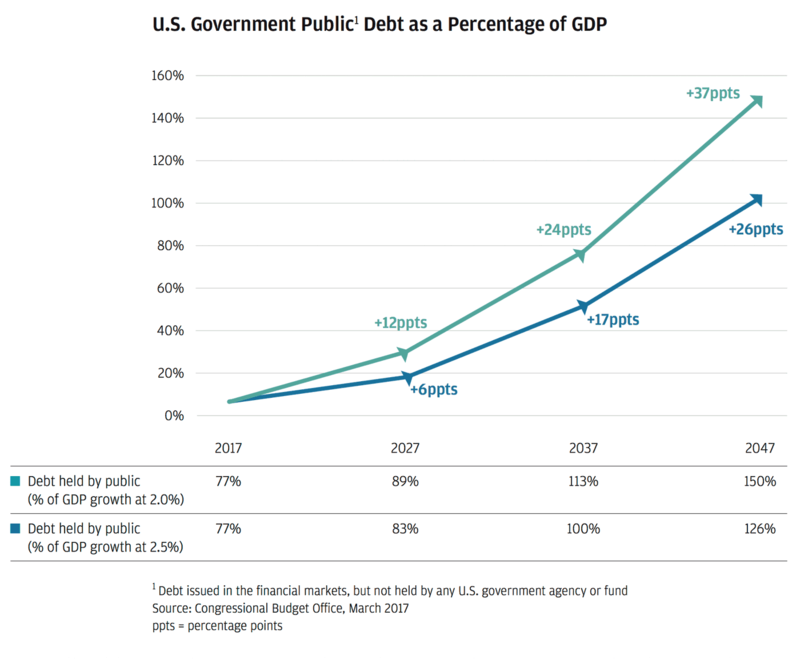 The chart below also shows the Congressional Budget Office’s estimate of the total U.S. debt to GDP, assuming a 2% real GDP growth rate. Hopefully, with the right policies we can grow faster than 2%. We estimate if we got the growth rate even a little bit higher (i.e., 2½%), then the debt burden gets a little lighter, but does not disappear. The real problem with our deficit is the uncontrolled growth of our entitlement programs. We cannot fix problems if we don’t acknowledge them. The extraordinary growth of Medicare, Medicaid and Social Security is jeopardizing our fiscal situation. We have to attack these issues. I am not going to spend a lot of time talking about Social Security. I think fixing it is within our grasp — for example, by changing the qualification age and means testing, among other things. When President Franklin Delano Roosevelt astutely put Social Security in place in 1935, American citizens would work and pay into Social Security until they were 65 years old. At that time, when someone retired at age 65, the average life span after retirement was 13 years. Today, the average person retires at age 62, and the average life span after retiring is just under 25 years. The United States has some of the best healthcare in the world, including our doctors, nurses, hospitals and clinical research. However, we also have some of the worst — in terms of some outcomes and costs. Administrative and fraud costs are estimated to be 25% to 40% of total health-care spend. Chronic disease accounts for 75% of spend concentrated on six conditions, which, in many cases, are preventable or reversible. While we don’t know the exact fix to this problem, we do know the process that will help us fix it. We need to form a bipartisan group of experts whose direct charge is to fix our healthcare system. I am convinced that this can be done, and if done properly, it will actually improve the outcomes and satisfaction of all American citizens. Aligning incentives systemwide — the United States has the highest costs associated with the worst outcomes because we’re getting what we incentivize. Studying the extraordinary amount of money spent on waste, administration and fraud costs. Empowering employees to make better choices and have the best options available by owning their own healthcare data with access to excellent telemedicine options, where more consumer-driven health initiatives can help. Developing better wellness programs, particularly around obesity and smoking — they account for approximately 25% of chronic diseases (e.g., cancer, stroke, heart disease and depression). Determining why costly and specialized medicine and pharmaceuticals are frequently over- and under-utilized. Examining the extraordinary amount of money spent on end-of-life care, often unwanted. To attack these issues, we will be using top management, big data, virtual technology, better customer engagement and the improved creation of customer choice (high deductibles have barely worked). This effort is just beginning, and we intend to start small. We will report on our progress in the coming years. 8. Why is smart regulation vs. just more regulation so important? It is absolutely necessary to have proper regulation. Often, though, we confuse more regulation with good regulation. What is really needed is smart regulation. If you speak with businesses, large or small, they will give a long list of the time, effort and documentation it takes to run their business. They will show you books of red tape, inefficient, outdated systems and extraordinary delays. To start a small business today, you need multiple licenses. We have given an example of this with infrastructure in terms of needing up to 10 years to get a permit to build a bridge. 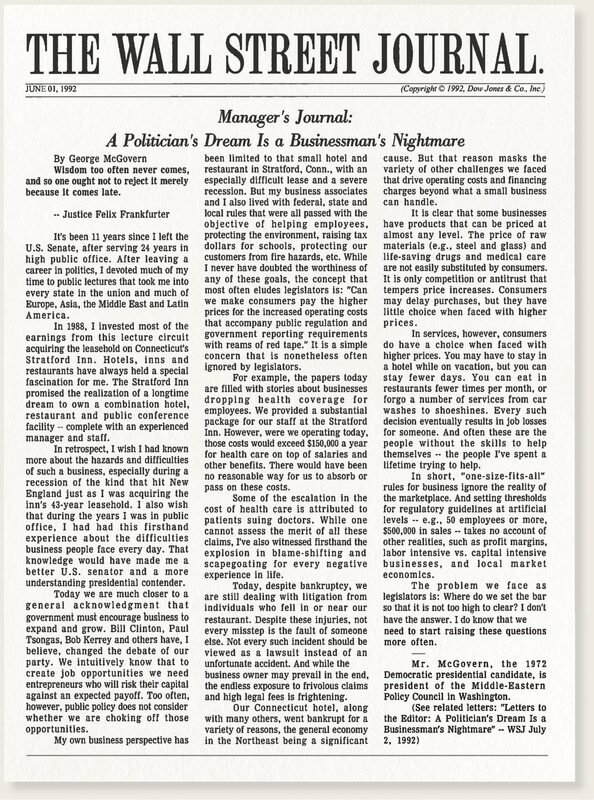 Please read the article written by a very liberal Democratic former U.S. senator and presidential candidate about what it was like to run a small business. The article provides excellent advice for all of our legislators and regulators. Unfortunately, he learned these lessons only after leaving his career in government. The current administration is taking steps to reduce unnecessary regulation by insisting that congressional rules around cost-benefit analysis be properly applied. It is also actively trying to put regulators in the right roles with the proper authority to use commonsense principles to make appropriate changes. By some estimates, approximately $2 trillion is spent on regulations annually, which is about $15,000 per household. While we believe much of this money is well spent (leading to cleaner water and air, and safer highways and hospitals, for example), it is hard to imagine that all of it is well spent. Decades of continuously expanding and overlapping regulation certainly can be streamlined and improved. There is little doubt that excessive regulation has adversely impacted innovation, growth and the formation of small businesses. The chart below shows the dramatic reduction in the net formation of small businesses. It is hard to know exactly why this is happening, but the main culprits are probably the cost and difficulties that unnecessary regulations cause , coupled with the lack of access to credit for new businesses. Another study examines the effect poor infrastructure has on efficiency (for example, poorly constructed highways, congested airports with antiquated air traffic control systems, aging electrical grids and old water pipes). This could all be costing us more than $200 billion a year. Philip Howard, who does some of the best academic work on America’s infrastructure, estimates it would cost $4 trillion to fix our aging infrastructure — and this is less than it would cost not to fix it. 9. Public company corporate governance — how would you change it? And the case against earnings guidance. Last year, I wrote about the decline in the number of public companies in the United States. Unfortunately, that trend has continued unabated. Indeed, if anything, it’s accelerated. According to one study, the number of U.S. public companies has fallen by approximately 50% over two decades (from 8,090 in 1996 to 4,331 in 2016). And that decline, it pains me to say, is a uniquely American phenomenon. Public company listings in other developed markets have increased over the same period. Fortunately, policymakers are sitting up and taking notice. In a report issued in October 2017, the U.S. Treasury Department decried the decline in the number of U.S. public companies and recommended several measures to stem the tide. Eliminating duplicative regulations, liberalizing restrictions on pre-initial public offering communications and removing non-material disclosure requirements were some of these measures. Jay Clayton, Chairman of the U.S. Securities and Exchange Commission, also has been quite vocal about the decline: He says it potentially deprives “Mr. and Ms. 401(k)” of the opportunity to participate in much of our country’s wealthy creation. I share Chairman Clayton’s concern. 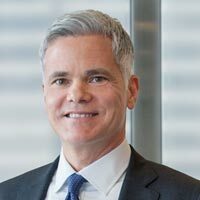 Too many private company owners look at the burdens tied to public company status — among them, frivolous shareholder litigation, burdensome disclosures that don’t get to the core of investor concerns, an unhealthy focus on short-term results and shareholder meetings that often focus on the trivial. Because of such factors, many private companies make a rational decision to stay private, particularly given rules that increasingly allow individuals to invest in private companies. Ultimately, that’s not good for America because public companies are a powerful economic engine for job and wealth creation. They are also responsible for one-third of all private sector employment, with millions of American families depending on public companies for retirement, savings for college and home purchases, and investment. So what can public companies do about these issues? For one, they can continue to engage policymakers. Second, they can continue to resist pressures to focus on the short term at the expense of long-term strategy, growth and sustainable performance. And in my mind, quarterly and annual earnings per share guidance is a major contributor to that short-term focus. It can cause companies to hold back on technology spending, marketing expenditures and other investments in their future in order to meet a prognostication affected by factors outside the company’s control, such as fluctuations in commodity prices, stock market volatility and even the weather. That’s why during my time as JPMorgan Chase’s CEO, we’ve never provided quarterly or annual net earnings guidance, and why we would support any company that considers dropping such guidance in the future. We totally support being open and transparent about our financial and operational numbers with our shareholders — this includes providing guidance or expectations around number of branches, likely expense levels, “what ifs” and other specific items. With their own sizable investment portfolios, most public companies could use their power as shareholders to urge public companies and asset managers to take a relentlessly long-term focus. Of course, shareholders of all stripes — and particularly institutional shareholders (asset managers, as well as asset owners) — have a critical role to play in public company corporate governance. Among other things, they should exercise their proxy voting rights thoughtfully, using independent judgment even where they use proxy advisors to inform their judgment. They should actively engage with company boards and management, as appropriate, to understand the company’s point of view and to convey their own. And they should evaluate and compensate their portfolio managers in a manner that reflects the investment time horizon applicable to the portfolio they are managing. That may mean using performance benchmarks over three-, five- and even 10-year periods, in addition to shorter period benchmarks. 10. Global engagement, trade and immigration — America’s role in the world is critical. Today’s world is as complex and dynamic as ever. Things like trade, immigration, technology and social media, as well as our ability to move capital and purchase goods with the click of a button, all are changing how we live and how we do business. A natural reaction to this disruption might be to turn inward, to build walls. Such an impulse reflects real and justifiable concerns about whether our rush to change has outpaced our ability to successfully adapt. At this moment of uncertainty, however, U.S. global engagement is needed more than ever. Following the devastation brought on by two world wars, the United States and other like-minded nations resolved to shape a new international order that would ensure a future unlike the past. In the succeeding years, America led the creation of a system defined by the rule of law and supported international institutions like the United Nations, the World Health Organization and the World Trade Organization (WTO). These institutions offered states a way to work out their differences around a conference table and address pressing economic and social challenges. Organizations like the North Atlantic Treaty Organization (NATO) were formed to enable collective action, promote peace and deter aggression. Treaties and coalitions were forged to limit the spread of nuclear weapons and to address threats such as terrorism, disease and climate change. America undertook efforts to promote and spread democratic values such as free speech and equality while standing firm against dictators and strongmen who would otherwise insist that “might makes right.” There should be no doubt that these efforts have made us all more prosperous, secure and free. The world has made incredible strides since most of us were born. We have overcome challenges once thought insurmountable. More than a billion people have been lifted out of extreme poverty in the last two decades. Food security is dramatically improving — a major driver of improving human health — and the number of undernourished people around the world is continuing to fall. Vaccines have almost entirely eliminated most infectious diseases around the globe — polio, smallpox, measles, mumps, diphtheria, rubella. Malaria has been eradicated in many parts of the world, and deaths have declined significantly in Africa and Southeast Asia over the last decade. These achievements and numerous others reinforce the overall positive trend line of human history. Reversing the interconnectedness built by our post-World War II institutions is neither desirable nor feasible. As a nation, we cannot isolate ourselves any more than we can stem the ocean’s tide. The international system provides agreed-upon rules of the road — and mechanisms for enforcing them. It serves as the basis upon which we can insist on fairer trade practices from competitors and adequate burden-sharing from allies. It is the means by which we can continue to improve people’s lives and livelihoods. The system, built at great sacrifice, continues to serve our interests. It should be preserved and defended — ideally under strong U.S. leadership. Any system created by humans, however, is ultimately fallible. Sustaining the current order and ensuring its longevity means acknowledging its flaws. We must have an honest conversation about its strengths and, more important, its weaknesses. Global GDP has more than doubled since 2000, yet too many people are being left behind — shut out of a growing economy’s rewards. Nations with a proud history of welcoming immigrants — including the United States, a nation of immigrants — are engaged in hotly contested debates over whether immigration is good for one’s country or not. Recognizing our extraordinary accomplishments is one thing, but we should acknowledge what has gotten worse. NATO has become less effective, serious issues surround trade and the WTO is unprepared to deal with today’s issues — and too bureaucratic and slow to fix them. The associated loss of faith in governments and institutions has manifested itself in a wave of political disruptions, none more surprising than in the United States itself. We are increasingly divided and unable to work out our disagreements. Retreating from the world is not the solution, nor is burning down the current system and starting anew. At the same time, we cannot and should not turn a blind eye to the real pressures millions of families face at the hands of globalization, technological advances and other factors. Ultimately, governments are charged with addressing the types of issues and popular grievances that led us to this moment of division and distrust. But increasingly, the private sector must also play a role. Business in total has a huge amount of capabilities and knowledge. Business needs to work with the government to drive good, long-term solutions. But if it is to play a helpful role, business must be less parochial about what is good for one’s particular company and more helpful about what is good for the people of our countries. Proper resolution of serious trade issues is good for the United States and for the rest of the world. We have entered a time of uncertainty over global trade. President Trump has rejected the Trans-Pacific Partnership (TPP) as not being in the best interests of the United States and is renegotiating the North American Free Trade Agreement (NAFTA). He has begun to demand material changes in our trade agreements with many nations and has begun to demand that nations reduce their trade surpluses with the United States, probably most importantly between the United States and China, the world’s two largest economies. We should acknowledge many of the legitimate complaints around trade. Tariffs and non-tariff barriers to trade are often not fair; intellectual property is frequently stolen; and the rights to invest in and own companies in some countries, in many cases, are not equal. Countries commonly subsidize state-owned enterprises. When the U.S. administration talks about “free” and “fair,” it essentially means the same on all counts. This is not what has existed. It is not unreasonable for the United States to press ahead for more equivalency. In last year’s letter, I spoke about NAFTA and said that while there are some clear problems, an updated agreement should be worked out in a way that is fair and beneficial for all parties. The logic to do so is completely compelling. The United States should define very clearly, and in detail, what it wants from China. The United States should lay out a distinct timeline — and determine what the reaction would be if it is not met. The United States should listen closely to China about any legitimate complaints it may have. This should be done in partnership with our largest allies, particularly Japan and Europe. The United States should revisit the Trans-Pacific Partnership and fix the parts considered unfair. The TPP could be an excellent economic and strategic agreement between America and its allies, particularly Asia. This is not against China: The country could at some point be offered the opportunity to enter the TPP if it demonstrates a willingness to meet its standards, which would improve upon the rules-based global trading system under American leadership. While the chance of having an improved trade deal with both Mexico and Canada, as well as a more mutually beneficial relationship with China is possible and preferable, there is always a chance that miscalculations on the part of the various actors could lead to negative outcomes. This obviously creates higher risk and more uncertainty until resolved. We need to resolve immigration — it is tearing apart our body politic and damaging our economy. We need to have — and believe that we have — proper border control. American citizens have the right to complain that we have not successfully protected our borders since the last immigration reform in 1986. In the 1986 amnesty, 3 million undocumented immigrants came forward, and now we estimate there are another 11 million undocumented people domiciled in our country. If the American public does not believe we have proper border control, nothing else can be accomplished. The “Dreamers” who came to America as undocumented children (there are approximately 2 million of them) should get a path to legal status and citizenship. We need improved merit-based immigration. Those who get an advanced degree in the United States should receive a green card along with their diploma. We need these skilled individuals in America. We could also improve on other merit-based immigration practices. Law-abiding, hardworking undocumented immigrants should have a path to legal status or citizenship. The American public should know this is no easy path. Back taxes should be paid, and citizenship could take up to 15 years. Finally, it is unlikely the American public will feel comfortable with immigration if we don’t revert to some core principles. Immigrants should be coming here because they want to be part of our country and who we are as a people. America was an idea borne of freedom, with freedom of speech, freedom of religion, freedom of enterprise, and equality and opportunity. People immigrating to this country should be taught American history, our language and our principles. The American public will not be pro-immigration if we don’t address these issues. We are devoted to earning the trust and respect of our shareholders, customers, employees and the communities we serve every single day. We will never lose sight of this. And we have an outstanding management team leading this mission — a group of dedicated executives with exceptional capabilities, character, experience and wisdom. I am humbled and honored to work at this company and with its great people. It is an extraordinary privilege and responsibility. On behalf of JPMorgan Chase and our management team, I want to express my deepest gratitude to all of our people — I am proud to be their partner. ©2018 JPMorgan Chase & Co.